With juniper at its heart, it unashamedly celebrates the integrity and character of traditional London Dry Gin: three fruits and three spices distilled in traditional copper pot stills. The nose is bright, crisp and fresh with an uplifting welcome of juniper. The palate: Juniper to the fore, supported by floral notes and spicy, warm cardamom. Plenty of citrus ‘zing’ complemented by the gingery spiciness of coriander. The earthy dryness of angelica kicks in on the finish. Other - This juniper blunderbuss was created by wine merchant Berry Bros & Rudd to make the ultimate G&T, and my goodness it delivers – piney, powerful, but with a lemon-sherbet sweetness. Sadly fruit flavoured spirits don’t count as part of your ve-a-day. They taste bloody good though . 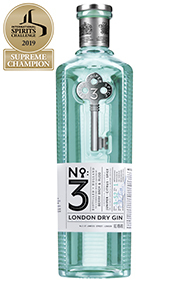 No.3 London Dry Gin, Named after the address of Berry Bros & Rudd (London’s oldest wine and spirit merchant), No.3 boasts six balanced botanicals with juniper at its core. Perfect for a classic martini or a gin and tonic with a twist of lime. Or both. Three centuries of trading, three fruits and three spices... Berry Brothers' No.3 is a triple triumph. Juniper, the key ingredient in gin is complemented by sweet Spanish orange peel, grapefruit peel, Angelica root, Moroccan coriander and cardamom seeds. Weeknend's must-have: The Gin. Named after the company's St James's Street address. It's clean and simple with juniper to the fore. Distilled in copper stills with coriander and earthy angelica, as well as juniper, this gin makes superb martinis. No.3 London Dry Gin is distilled to a proprietary recipe of berry Bros and Rudd, London's oldest wine and spirit merchant. The name No.3 refers to the address in St James Street, London: their home since 1698. With juniper at its heart, it unashamedly celebrates the integrity and character of traditional London Dry Gin: three fruits and three spices distilled in traditional copper pot stills. 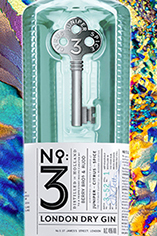 Distilled in traditional copper pot stills in Holland, No.3 is designed to reflect the essence of what a good traditional gin should be and meet the modern challenge of marrying well with tonic and in cocktails. With assertive juniper balanced with sweet orange peel and a twist of grapefruit this gin's distinctly citrussy tones are lengthened nicely by a warm backnote provided by cardamom seeds. A bottle would make a nice gift, both for its drinkability and handsome presentation. Word Of Mouth Blog, October 2012 Created using just six ingredients- juniper, Spanish oranges, grapefruit peel, angelica root, corinder seeds and cardamom pods- and distilled in a traditional copper pot still, No. 3 has a bright, crisp nose, flavoured with juniper and spice with a citrus zing. No.3 is the London Dry Gin distilled to a proprietary recipe of Berry Bros. & Rudd. With juniper at its heart, it unashamedly celebrates the integrity and character of traditional London Dry Gin. Three fruits: Juniper, from Italy, not only gives gin its name, but also the unmistakable gin taste of pine and lavender. Sweet Spanish orange peel gives freshness in the form of clean, crisp citrus, and grapefruit peel to give an extra lift of citrus. Three spices: Angelica root adds an earthy quality and helps to make the gin dry. Moroccan coriander seed releases a lemon flavour during distilling as well as adding a spicy, slightly peppery finish to a well-made gin. And cardamom pods which add a spicy, aromatic, yet warm bite. No.3 is distilled in traditional copper pot stills for us by a family-owned company who have been distilling in Schiedam, Holland for over 300 years. At Berry Bros. & Rudd we believe that No.3 recreates the classic experience of London Dry Gin due to three simple things done well: the careful sourcing of the ingredients, the painstaking processes of production and the exquisite presentation in its unique bottle. No.3 is absolutely ideal for a classic dry Martini or Gin & Tonic.